In my twenties, I learned how to drive a stick-shift. This was not something I wanted to do; it was something I needed to do, as a friend's manual transmission car was the only vehicle I had at my disposal one summer. No one is less suited for driving a stick shift than I am: I am extremely uncoordinated and have no mechanical aptitude. For the first two weeks, my friend and I had to switch drivers at every intersection, as I simply could not manage to get the car into gear (the drivers behind us at traffic lights were thrilled with this arrangement, as you can well imagine). But then, after a couple more weeks, I could do it, and not only could I do it, I could do it with ease. It became second nature to me. It became unthinkable that I would stall. So this task that seemed impossible became not only possible, but easy, within a finite amount of time. The same is true for just about every writing project that I undertake. Right now I'm working on writing my own chapter for the collection of scholarly essays I'm assembling and editing on ethics and children's literature. My piece is supposed to be an expanded and revised version of a paper I gave at a Children's Literature Association conference year before last. In the paper I look at a passage from my beloved Jean-Jacques Rousseau, where he speculates that in our attempts to moralize to children we may actually be introducing problematic behavior to them that they wouldn't have engaged in otherwise: for example, if we warn children not to lie, we may be the ones who give them the idea of lying in the first place. I then take this worry of Rousseau's and use it to analyze several recent children books that try to challenge children's prejudices, arguing that such books themselves may be the agents of inculcating these very prejudices in their readers. The problem is that in the conference paper I had said all I had to say on the subject, and now I needed to double the paper in length. And the more I thought about expanding the paper, the more I wasn't even sure I agreed with what I had said or that it would hold up under further scrutiny. I have had "revise book chapter" on my monthly to-do list every month since January. Truly. And every month I haven't been able to make myself face it because I really thought it couldn't be done. Then this week, I had to. The book is due to the publisher at the end of July. Procrastination was no longer an option. I considered simply abandoning the project: the book would be fine without one more chapter. But this is MY book - how could MY book not have a chapter by ME in it? So I set to work. Starting this past Monday, I worked on the chapter for an hour a day. Once I sat myself down at my computer for sixty minutes each morning, I found I had plenty of other things to say. I could add a fuller introduction and set up the problem more effectively. If I had doubts about my thesis, which I did, I could raise those doubts myself and do my best to reply to them, increasingly confident that the discussion was thought-provoking even if not entirely convincing. Now I'm almost done. The piece should be ready to go, for better or worse (no, for better!) by tomorrow. Five hours. That's all it took. From impossible to done in five hours. When will I ever learn that all it takes to learn to drive a stick shift, or to revise an article, or to write a book, or to lose weight, to do ANY of these things . . . is an hour a day? A few years ago, as part of my charge as the philosophy department's teaching mentor, I observed one of our graduate student instructors. As I wrote up my comments on the class, I remember one comment that I didn't write. The pedagogy for the class had been close to flawless, but one fairly significant problem with the class remained: the student instructor simply needed to be smarter. That's how I felt about myself this morning as I worked on revisions for a philosophy paper that is going to be published in an edited volume on the concept of manipulation, coming out from Oxford University Press some time next year. One of the editors of the volume sent me editorial comments on the paper, so that I could revise the paper in response to the comments. But the fairly significant problem in my doing so was this: I simply needed to be smarter. For those of you who are non-philosophers, let me tell you how academic philosophy works. We write papers in which we defend some original thesis supported by our best arguments. Then other people read our work and come up with devastating counter-examples to our thesis and point out fatal flaws in our arguments. Then we are supposed to come up with some ingenious re-statement of our thesis that will avoid the counter-examples and fix the arguments so that all the premises are true and the logical structure of the argument is valid. What I'm good at is coming up with interesting and thought-provoking things to write about. So in this volume on manipulation, I think I chose the freshest and most novel topic. Almost everybody else wrote about ordinary interpersonal manipulation of one person by another, trying to come up with a workable definition of what counts as manipulation and a persuasive account of what, if anything, makes manipulation morally wrong. I wrote about aesthetic manipulation, manipulation as an aesthetic flaw in an art work. In the course of my discussion I had occasion to mention art works as diverse as the film Slumdog Millionaire, Beverly Cleary's children's novel Ramona the Pest, and the song "MacArthur Park." The style of the paper was lively and engaging. It gave the reader a lot to think about. But then I got the comments from the editor. While generally positive, he posed a devastating counter-example to my thesis and pointed out various fatal flaws in my arguments. I read over his comments, impressed by how agile his brain is compared to mine at this kind of thing. I had no idea how to reply. I simply needed to be smarter. Oh, well. One can get smarter with enough time: that grad student instructor became plenty smart over the course of her time in our doctoral program and wrote a splendid dissertation. But it takes a lot of work over a long stretch of time to get smarter, and I didn't have the time to get smarter between now and when these revisions were due, nor the inclination to do the hard intellectual work that would make me smarter. So I did what I could. I made an attempt. I fixed a couple of small fatal flaws. I tweaked my thesis a bit. And you know what? My paper is still interesting, thought-provoking, lively, and engaging, despite a devastating counter-example and fatal flaw or two or three. Yes, it would help if I were smarter, but there are lots of ways of being smart. The paper is done, to the best of my not-so-smart abilities, and I think it makes a good addition to the volume, warts and all. In the end, I was smart enough. And smart enough to know when smart enough is good enough. After many days spent organizing my entire life upon my return to Boulder, last week it was finally time to settle down to some actual work. I have many projects on my summer to-do list: finishing up the editing of the ethics and children's literature collection, revisions on a philosophy paper on aesthetic manipulation, comments on a paper that I will be giving at the Rocky Mountain Ethics Congress in August, a tenure review (children's literature), a promotion review (philosophy), and more. But none of those projects tempted me as much as the revisions on my cookie jar book. As I prepared to depart from my two years in Indiana, I set myself the task of finishing up the manuscript for a book I'm working on that is set in Indiana, in a town called Westcastle that bears striking similarities to a town called Greencastle. It's a time travel story where the kids travel back to different exciting times in Indiana history by means of an enchanted cookie jar. To travel back in time, they bake a cookie from a recipe of that time period, and insert it into the jar; to return to their own time, they eat the cookie. I loved writing of this book more than I've ever loved writing of anything. This is the first time in ages that I've written a whole book without a contract in advance, but I figured that there was no better use of my time than spending rapturous hours living in the world of this story. I finished the full manuscript two days before I left to drive back to Colorado. To give myself a sense of urgency - it's hard to do anything, however pleasurable, without some kind of deadline - I decided that I wanted to have the manuscript revised and printed out to distribute to my writing group at our meeting at my house this coming Monday. (Of course, the reason to give it to them is to get their suggestions for further revisions, but I wanted to get the most obvious glitches fixed myself before I asked for their comments). First I read the whole manuscript from start to finish, something I hadn't yet done. While there were massive inconsistencies that emerged as the book changed direction in various ways from what I first envisioned, I have to say that I loved it. I usually love my own books. This isn't as conceited as it sounds, as I think most authors find that their books resonate with their own sensibilities as readers: we write the kind of books we ourselves like to read. As I read, I made all kinds of notes for where to add, what to add, how to add, and sometimes, where, what, and how to subtract. Then I became a revising fiend. I can only write new material for an hour a day; hence, the title of this blog. But I can revise until I'm so tired I can hardly make my fingers keep typing. I can revise from morning to night. Just a few more pages, just a few more pages . . . It's obsessive, addictive, euphoric. I finished up on Thursday and printed it yesterday And now that lovely stack of big fat manuscripts (it's my longest book to date, at over 50,000 words) is sitting in my little home office awaiting distribution to its first readers. I hope they like it. No, I hope they love it. And then I hope my agent loves it, and some editor loves it, and readers love it. But for now, it's enough that I love it. I love you, cookie jar book, yes, I do! I can't deny that there have been stresses in returning to my life in Colorado after my blissful sojourn in Indiana. It's hard to deal with all that I haven't dealt with for two years, to face all that I haven't faced for the past twenty-four months, and to get serious about THE REST OF MY LIFE. Fortunately, I have my little notebook where I can make lists with headings like "July Tasks" and "What Do I Want the Rest of My Life to Be?" 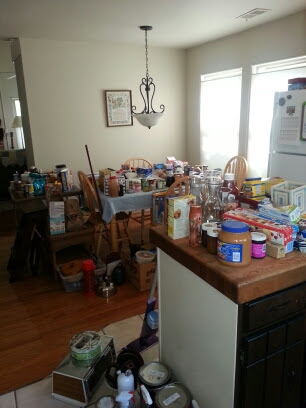 And fortunately, I can express my need to be able to get a grip on at least some part of my life by launching into the project of CLEANING MY PANTRY. 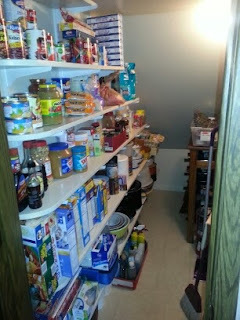 The pantry was filled with unspeakable amounts of stuff. When my mother lived at Presbyterian Manor, Safeway would come twice a week with a great giveaway of dented cans, rolls of paper towels packaged inside torn plastic bags, holiday-themed paper plates the week after the holiday; my mother could never resist anything free, so she would take all that stuff and give it to me. When I cleaned out a family home two summers ago, I carted away heaps of partly used-up cleaning supplies as well as many kitchen items. Then there was all the stuff various family members (including me) bought, not realizing that we already had massive quantities of it - such as, literally, almost two dozen three-packs of those little cans of tuna. It was time to clean the pantry! Step two: clean the shelves and the floor, grateful that there were only a very few mouse droppings in out-of-the-way corners (thank you, Miss Snickers!). Step three: throw away all food with iffy sell-by dates and almost-empty containers of cleaning products. Consolidate cookie tins, putting little ones inside big ones. Consolidate everything! Step four: put the remaining items back on the shelves in beautiful, gleaming, breathtaking, soul-replenishing order! Oh, how I love a project like this. When I'm sad or stressed now, overwhelmed by THE REST OF MY LIFE and what it holds, I just go open the pantry door and admire the pantry. I do this several times an hour. (And I'm sparing you the similar before-and-after photos of the shelves above the washer-dryer!). The Stoic Epictetus tells us that in life there are two kinds of things, things that are in our power and things that aren't, things that are up to us and things that aren't, things we can control and things we can't. On which category of things, in each of these pairings, should we focus our efforts? Yes, you guessed it. If Epictetus were still alive, I'd text him these before-and-after pictures of my pantry. After going downstairs to admire the pantry just one more time.